It's that time of the year again when thousands of college spring breakers descend on the beaches of Miami for some serious partying and some fun in the sun. 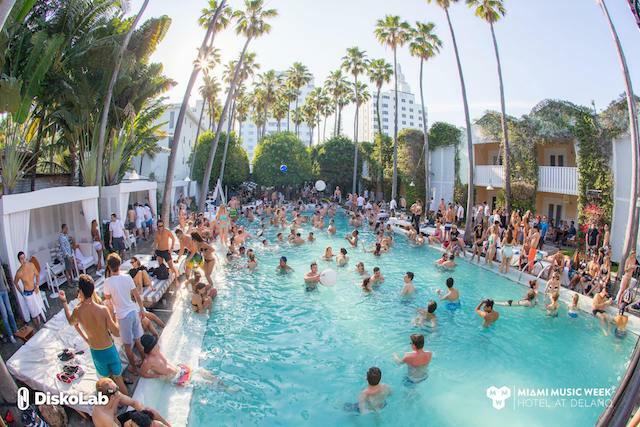 This is a specially busy time of the year with some mega events taking place that draw the party crowds: Miami Music Week, Winter Music Conference and ULTRA. 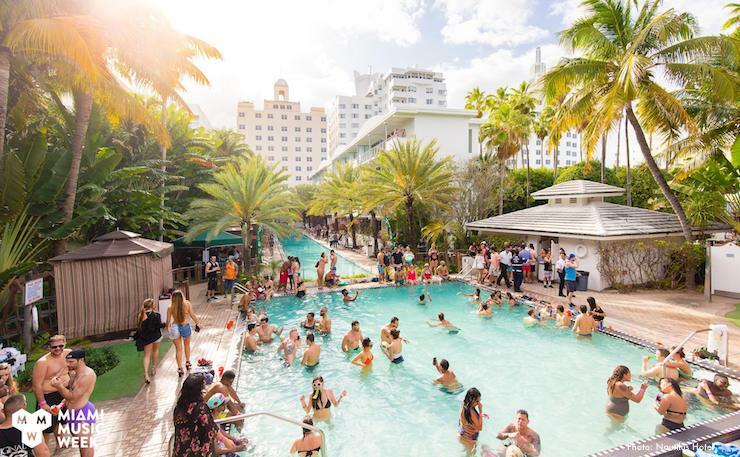 Here are this year's most popular Spring Break events, check out the areas where the party scene will be sizzling and when for the best areas to stay in (or avoid). Whether you are here to party your heart out or just want to enjoy and relax in the sun, here are some top places to stay in the Magic City. 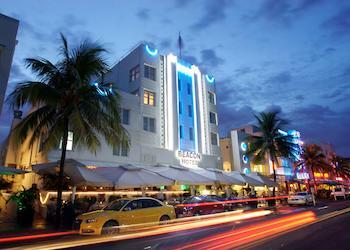 Miami Hostels: for those whose priorities are price, party and beach! South Beach Hotels on Ocean Drive, Miami's legendary strip, will be in the heart of party central with bars, cafes, shops, and the sizzling nightscene at your doorstep. That also means higher noise levels (they will actually hand you ear plugs when you check in), neon signs, horrendous traffic, and hordes of intoxicated mortals. At the heart of it all is the Clevelander with its legendary pool party scene and live entertainment into the wee hours. 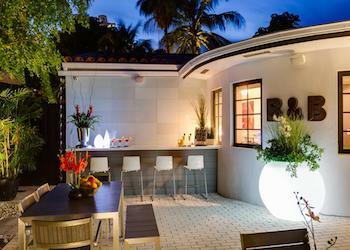 A location a few blocks from the beach and the club scene can save some money (for South Beach standards), Gale South Beach and Bars B&B are top choices where you are still within easy reach of the mayhem. 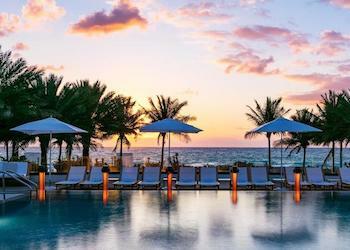 For the ultimate Spring Break splurge, a beachfront hotel in South Beach is hard to beat, The W South Beach and The Shore Club both on the north end of South Beach are fantastic options with some of South Beach's hottest party spots. 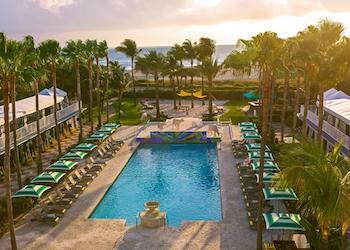 There are hundreds of parties and events during Miami Music Week and the Winter Music Conference, these hotels will be hosting some of the most popular events and parties, these are not the spots to stay for peace and relaxation during that week. Miami Music Week and the Winter Music Conference will take place from March 25 to 31, 2019. 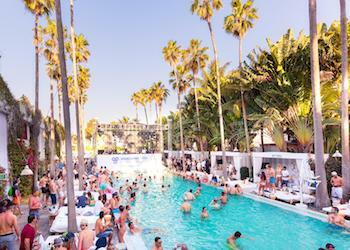 The official Miami Music Week Hotel is the Delano South Beach, and is the epicenter of some mega partying which spreads to the nearby hotels, also top choices to stay including The National and the Surfcomber. 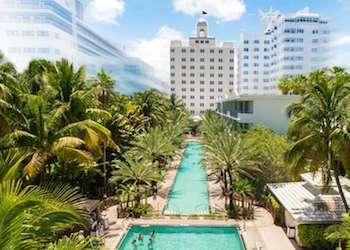 The official hotel of the Winter Music Conference is the Faena Hotel in Mid-Beach and most of the seminars and "industry" events take place in the Faena District. Party events however are at various venues throughout the city. 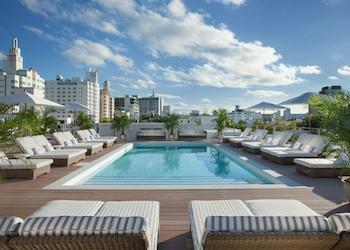 If you will be participating in any of the seminars the Faena Hotel and Faena House are top choices. Here are some more top choices in Mid-Beach, including value, boutique, and more oceanfront splurge options. Please be aware of the many extra fees you may encounter and check what is included in your quoted rate. Most hotels charge a "Resort Fee" which can run from $20 - $40 per day extra and cover things like beach chairs and umbrellas (yes, seriously). Cleaning fees in the case of apartments and rentals are billed per stay, $100 - $150 so consider this if only staying for a couple of days. Parking and valet services can tack on an extra $35-$50 per day. Getting around South Beach on foot or bike is best, having a car if most of the time will be spent in this area is more of a liability as parking is not particularly abundant, valet parking highly inconvenient. UBER and LYFT are better options. The Clevelander IS party central... all year 'round... with its iconic pool party scene day and night... this has been one of South Beach's pioneer Art Deco Classics with over 75 years of history and certainly one of the original party spots in the area... and still going strong. Food and drink is available at all venues and of course a mind-boggling assortment of frozen drinks and cocktails. Dishes are casual and menus change with the season. 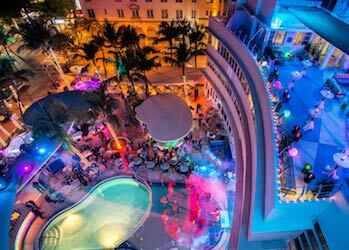 Or choose the Clevelander's sister property, Essex House, located just behind, where you can chill and unwind in a retro-cool setting, with all the party perks of staying at the Clevelander, the best of both worlds! 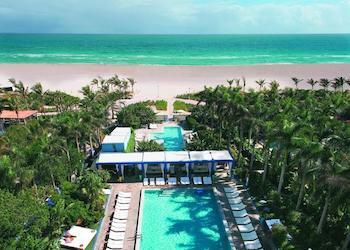 ›› Gale South Beach part of the Curio Collection by Hilton is a member of Hilton Honors, redeem/earn reward nights! Tucked on a small residential side street a ten-minute walk from Ocean Drive, Bars B&B is a charming boutique Bed & Breakfast style accommodation away from the glitz but still conveniently located. The superb staff, inviting Asian-style courtyard, freshly made-to-order breakfast served al fresco and a nightly wine and cheese happy hour to unwind at the end of the day make for a very pleasant stay and a top value option. There are only seven rooms that open to a central common area. Accomodations are on the small side but comfortable and decor is modern and minimalist. All rooms have a refrigerator, TV, some have DVD players. The outdoor pool and jacuzzi in the backyard are a nice area to lounge around. 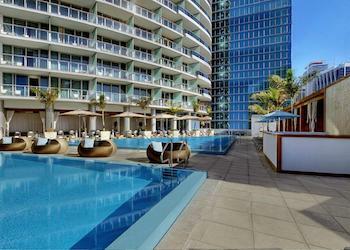 The beach is a 10-minute walk away, the Bars provides beach towels, umbrellas and lounge chairs free of charge. 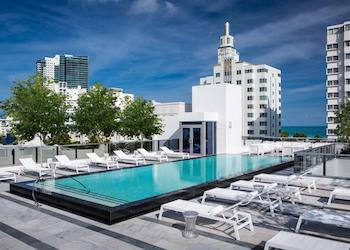 Over the top would be an understatement, everything at The W South Beach oozes hipness and glamour in a contemporary style... high ceilings, dark woods, marble walls... plus two bars and WALL Nightclub, one of South Beach's hottest party spots. 408 spacious rooms and suites spread over 20 floors, each with balcony with stunning ocean views, marble-lined bathrooms, a kitchenette, Bose sound system, Bliss toiletries. Three dining options: Smart casual Mr Chow is open for dinner offering Chinese cuisine, The Dutch with an eclectic atmosphere is an American melting pot of Caribbean, Latin and Asian flavors, and the poolside bar and grille. If noise is an issue, choose a room in the higher floors away from the pool and nightclub scene. 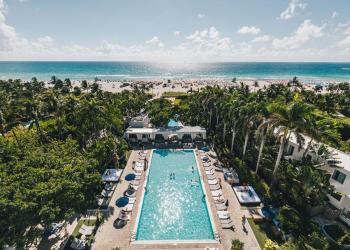 Next to the Delano, this historic South Beach oceanfront hotel features 116 newly designed city and direct ocean view guest rooms in the Tower and 36 luxurious cabanas and suites, skirted alongside native tropical palm trees and Miami Beach's longest infinity-edge pool. 411 rooms and suites exquisitely appointed, arranged over 30 floors all with private balcony, rooms on floors 18-30 offer stunning views of Biscayne Bay and the Miami skyline. With 118 rooms and 28 suites arranged over 10 floors, all with private balconies overlooking downtown Miami or the bay, floor-to-ceiling marble bathrooms. Each guestroom offers a stocked kitchenette or full kitchen and gourmet minibar for a homey but luxurious touch. A Philippe Starck-designed spa, featuring a reflecting pond and hot and cold plunge pools, two oversized hot tubs and a fitness center. 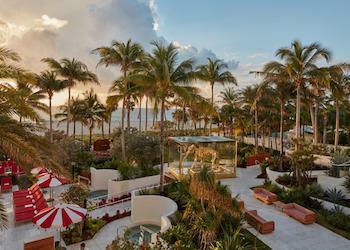 Everything at Faena is over-the-top, the hotel's design where commissioned and acquired art is deeply entrenched, the stellar service, unique restaurants and lounges providing world-class entertainment and experiences in house, and naturally, the fantastic oceanfront setting with mesmerizing views. Tierra Santa Healing House Spa features one of the largest hammams available on the East Coast, along with shaman-developed body-healing rituals and treatments, and technologically advanced facial treatments. There's Day Spa Packages, In-Room Spa Experiences as well as Spa Suite and Couples Treatments. Just accross the street, the hotel's boutique sister property, Casa Faena, in a historical building with a Mediterranean flair, offers a more intimate and quaint alternative with access to the posh amenities of Faena Hotel, i.e. beach access, restaurants, gym, etc. 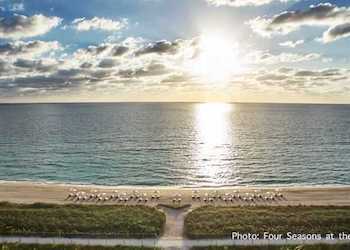 Spring Break in Miami is a great chance for families seeking a break from the cold temperatures, and we do have plenty of beaches where you will not be bothered with partying crowds and noise. Party central concentrates around South Beach where traffic, loud music, raucuous crowds will be out on force, so staying away from this area will assure you a more tranquil vibe so you can enjoy your surf and sun with the family. Just 10 blocks north of the party atmosphere and pumping music of South Beach, this area commonly referred to as Mid-Beach is your classic Miami Beach with a more mellow and refined atmosphere, certainly less crowded than the busy stretches of Ocean Drive but still with a very lively vibe and with plenty of entertainment around. And of course with a couple of miles of prime ocean frontage, there is no shortage of waterfront hotels with direct beach access in Mid-Beach. Surfside is a small and charming beachfront community sandwiched in between trendy Miami Beach and posh Bal Harbour and extending from 87th Street to 96th Street. 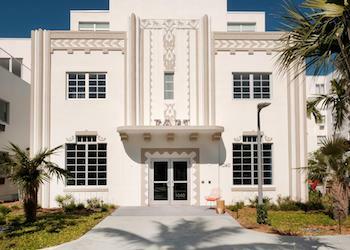 With a mile-long pristine beach, a pedestrian-friendly "downtown" area with plenty of neighborhood shops and cafes, lovely community and family-friendly vibe, the town of Surfside makes for a very delightful stay for those seeking a quieter location while still within easy access to the hustle and bustle of South Beach. 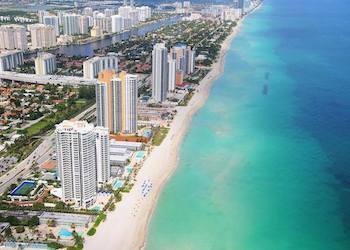 Sunny Isles is located on the barrier island just north of Miami Beach. 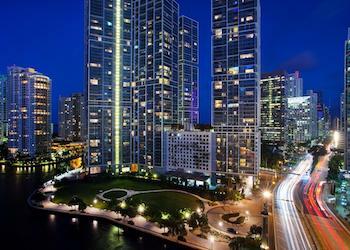 Despite being in the northernmost part of Miami, it is still readily accesible to the popular spots in South Beach with public transport or a short Uber ride.